Chasing Roots: When Will We Wake Up? 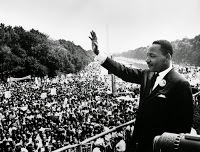 I write about this National Holiday each January, and in preparation for doing so, I reread my previous years' MLK Jr. Day posts. I then take bits and pieces of what I have written in the past - the words and stories that still resonate - and create around them a new post, one that aligns with what I have read about, witnessed, and experienced over the course of the previous year. Of the words below, some are old, some are new, and all were written with the singular goal of making progress toward peace and equality. Recognized as one of America's greatest leaders, Martin Luther King Jr. believed that all people - regardless of the color of their skin - should be awarded equal rights and access under our nation's laws. All human beings, simply because they live and breath, should have the right to work and earn an honest living for themselves and their families, the right to vote, the right to a quality education, and the right to use all public places. I believe that all people - regardless of the color of their skin - should be awarded equal rights and access under our nation's laws. I believe that all people should be evaluated by their individual words and actions, and that all people should use words and actions to form opinions of others. And I believe that our differences - from the color of our skin to our religion to our sexuality - are actually what unify us as a people. It is our differences that make us essentially the same: we are all unique individuals, worthy and deserving of respect and kindness from our fellow human beings. Our differences should be celebrated instead of ignored, or worse, used to justify discrimination. My personal beliefs and the words I use to describe them aren't perfect, or complete, but they adequately express what I desperately want our world to look and feel like and what I want my children to understand about Dr. King's contributions to mankind. In 1963, while speaking to 250,000 Civil Rights supporters on the steps of the Lincoln Memorial, Martin Luther King Jr. made history. "I have a dream that one day this nation will rise up and live out the true meaning of its creed: We hold these truths to be self-evident: that all men are created equal. I wish I could end this post on a positive note, but I just can't. The events of last few years have highlighted for me just how great the distance we have yet to travel on our quest to reach Dr. King's goals of empowerment, equality, and peace. Why, almost 55 years later, are we still dreaming? When will we wake up?